President Trump campaigned as the law-and-order candidate and pledged to be "ruthless" in waging the war on drugs after taking office, while Attorney General Jeff Sessions pushed the need to "hammer" drug dealers. "We are returning to the enforcement of the laws as passed by Congress, plain and simple," Sessions said in May as he directed federal prosecutors to pursue the most serious charges against suspects. "If you are a drug trafficker, we will not look the other way, we will not be willfully blind to your misconduct." But the hard-line stance the Trump administration is taking in the war on drugs isn't translating into higher drug prosecutions -- at least not yet. During the first five months of Mr. Trump's presidency from February through June, only 8,814 drug offenses were federally prosecuted, compared with 9,687 cases prosecuted over the same period in 2016, according to a July report from Syracuse University's Transactional Access Records Clearinghouse (TRAC). That's a dip of 9 percent. In June alone, there were only 1,578 new prosecutions for drug crimes, down 16.1 percent from May, according to TRAC, which obtained the data from the Executive Office for United States Attorneys through the Freedom of Information Act. The Trump administration's first five months, combined with the Obama administration's final seven months in 2016, account for a 12-month period that resulted in fewer prosecutions than any similar period of the last quarter century, TRAC found. "The Department of Justice is unable to vouch for TRAC methodology, and many variables play into those statistics," Ian Prior, a spokesman for the Department of Justice, told CBS News. "It is not a surprise, however, to see drug prosecutions drop since 2012 following the previous administration's directive to federal prosecutors to understate the quantity of drugs distributed by dealers. 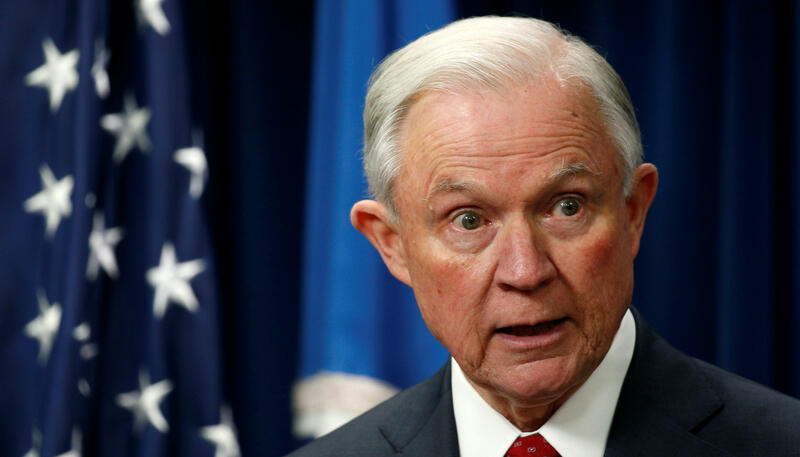 Attorney General Sessions recently reversed that policy, and continues working on new initiatives that will allow the Department of Justice to use every tool available to aggressively target drug traffickers and others responsible for the unacceptable drug crisis." Sessions took his largest step in the war on drugs in May, when he reversed an Obama-era policy under former Attorney General Eric Holder that directed federal prosecutors to ease charges leveled against some non-violent lower-level offenders, many of them drug offenders. Sessions directed federal prosecutors to "charge and pursue the most serious, readily provable offense," which will likely trigger mandatory minimums and longer prison sentences. "This policy affirms our responsibility to enforce the law, is moral and just, and produces consistency," Sessions wrote in a memo sent to U.S. attorneys at the time. The move broke with a bipartisan push for sentencing reform legislation on Capitol Hill, as Democrats and many Republicans alike looked for alternatives to extended incarceration periods that cost taxpayers and have done little to keep convicts from reoffending. Holder criticized the reversal immediately, saying the policy shift wasn't "tough" on crime, but it was "dumb on crime" and "ill-informed." But Sessions, who opposes legalizing marijuana, links drug trafficking to higher homicide rates in some cities, saying tougher tactics are key to the president's efforts to keep America safe. Sessions was talking tough on drugs long before May, giving some indication of where his DOJ was headed. In March, he said part of the solution to the war on drugs is to "hammer" drug dealers and other criminals, and to bring back the public campaigns against drug use of the 1980s and 1990s. Sessions was a federal prosecutor in those decades, when the war on drugs was in full swing. The attorney general has also made it clear he won't only only be tough on drug dealers, insisting that he would try to promote a culture that rejects drug use on moral grounds. "This is not acceptable," Sessions said in a speech Monday about the opioid epidemic. "We must not capitulate intellectually or morally to drug use. We must create and foster a culture that's hostile to drug use." But it may take a while for the Trump administration to reverse the downward trend in drug prosecutions. Many of the posts for the U.S. attorneys who would pursue priorities like drug-related crimes are occupied by acting prosecutors, as opposed to permanent appointees. In March, the Trump administration abruptly dismissed most of the remaining Obama-era prosecutors at the DOJ, ordering 46 holdover prosecutors to submit their resignations. Months later, Mr. Trump has nominated more than two dozen replacements, but most have yet to be confirmed by the Senate.